Beachside Suites are ideally situated adjacant to Minehead seafront and only a few minutes walk from the town centre. Just a five minute drive away and you can be in the glorious Exmoor countryside. 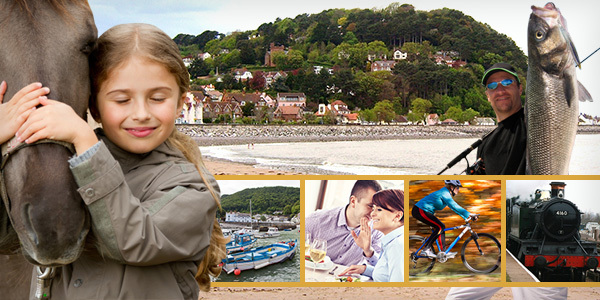 Minehead is located in the place where Exmoor National Park meets the sea. It is ideally suited for lovers of coast and countryside. The mile long expanse of Minehead beach is a delight to behold and just right for seaside fun. Predominately sand, with pebbles near the harbour, it is backed up by a level promenade boasting superb views over the Channel towards Wales. There is lovely coastline and countryside to explore in Dunster, Watchet, Blue Anchor, Selworthy, Porlock, Wootton Courtney and more. Further afield is the county town of Taunton, Tiverton and even Exeter, all being within easy reach. Boats can be chartered from Minehead harbour for fishing trips and the paddle steamer “The Waverly” also calls here, on the way to Lundy Island, in the Bristol Channel. Undercover attractions in Minehead include: Butlins, West Somerset Railway, Minehead Eye, The 400 seat Regal Theatre and more. Located along The Avenue, and adjacent streets, are an excellent selection of: restaurants, cafes, bars and nightclubs, along with local shops selling everything from buckets and spades to a Friday Farmers market. Beachside Suites are ideally situated for a coastal holiday or as a base to explore Emoor and the many attractions of Somerset and Devon, which are just a short distance away. Take a look at drop down menus in this section to give you an inkling of how much is available to you when you stay at Beachside Suites. A holiday at Beachside Suites is all you have ever wanted!